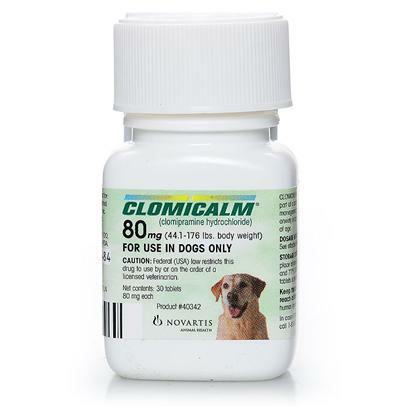 Clomicalm is an orally administered, prescription anti-depressant, intended to treat separation anxiety in dogs. Clomicalm specifically addresses excessive barking, destructive behavior, and inappropriate elimination. As a non-tranquilizer, your dog's memory and personality remain intact. Clomicalm works best in combination with training and behavior modification techniques, and is intended for dogs 6 months and older. Clomicalm 40mg has been discontinued by the manufacturer. Please speak to your Veterinarian about a different dosage. Clomicalm is the Generic Alternative to Anafranil. Clomicalm may cause drowsiness. Stop giving your pet Clomicalm and contact your vet if the pet experiences difficulty breathing, hives, irregular heartbeat, difficulty urinating, seizures, fever with increased panting, muscle stiffness or weakness, or swelling of the lips, tongue, or face. Administer Clomicalm to the exact specifications prescribed by veterinarian. Give Clomicalm orally with food and lots of water.